'Chopper Cop' debuted in 1972 as a Popular Library paperback. Author Paul Ross is actually Dan Streib, the man behind 70s action oriented series' like 'Killsquad', 'Hawk', 'Steve Crown' and 'Death Squad'. The series would last three installments with Streib writing the first two. While the cover, font and badge logo would indicate a high-paced action formula fitting of Streib's writing style, the end result is an entirely different type of story. Personally, I think this was probably a grand misplacement of what literary power-broker Lyle Kenyon Engel envisioned when hiring Streib. Engel would later denounce the author, furthering the theory that the supply didn't meet the demand. 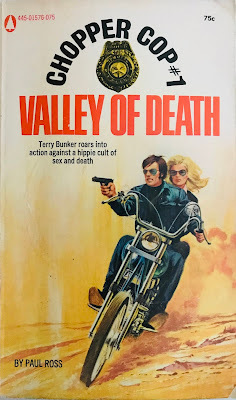 Think of series debut, “Valley of Death”, as an eerie, Gothic investigative novel. Odd I know, but Streib's use of heavy sea fog, moonlit graveyards, old mansions and an abandoned mining town are the perfect backdrops for this dense thriller. They are almost characters themselves, springing up from time to time to introduce darkness and death. No, this isn't the long-haired, biker riding “Easy Rider” that's depicted on the book cover, but our hero Terry Bunker does dress the part. He works for the California Governor, sort of a special operative piece that is utilized by leadership as an official State Department of Criminal Investigation...investigator? He receives requests from the Governor to solve crimes. He's extremely successful, allowing him to refer to leadership as “hey guv” despite hatred from his departmental peers. The debut mystery is a rather grim one; young wealthy women are committing suicide in San Francisco and Sacramento. Yet, they are reaching out to their loved ones posthumously through bizarre phone calls or supernatural apparitions lurking just outside the window. The crime? Whoever is behind the ghostly apparitions are ransoming the return of these resurrected dead girls for millions of dollars. The culprit might be a strange seaside cult that's sacrificing drugged women for cash. But that doesn't explain the seemingly life after death undertaking of these heists. Bunker isn't as funny as say...Kolchak, Fox Mulder or Carter Brown's bumbling detective Al Wheeler. But he's no Shaggy either. This character is vulnerable, even scared at times as he navigates ghosts and graves to find the criminal leader. But he can get the job done. It's a slap in the face to readers looking for a hard-edged, bone-breaking chopper cop. But once you can forgive the creator, this is a really fun mystery that had some longevity. I could see this sort of thing working on multiple levels, whether supernatural or just a “crime of the week” featuring some abstract scenario. Unfortunately, the struggle between publisher and author led to this being canned shortly thereafter. I'm on the hunt for book two.